Terror Behind the Walls is an annual haunted attraction held around Halloween at the Eastern State Penitentiary. It features video presentations of real ghost stories from the penitentiary, tours of haunted houses and actors scaring unsuspecting visitors. An earlier post compared the philosophies of two prison systems, the principle of penitence of the Eastern State, and the principle of punishment of the New York System. 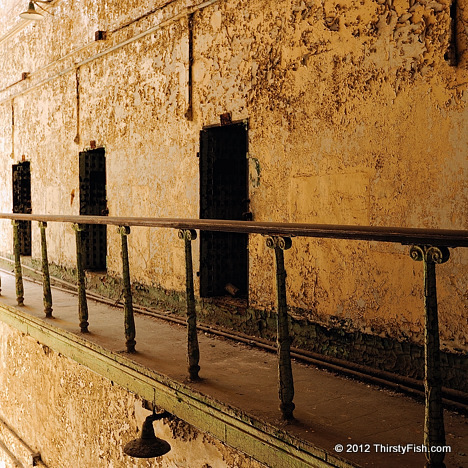 Although from its inception the Eastern State was supposed to exemplify prison reform, in practice, there was a great deal of terror behind the walls. Prisoners were locked in their cells 23 out of 24 hours a day. Before they were taken outside to get a glimpse of sunlight, they would be hooded so that they could not interact with other prisoners. This literally drove many prisoners into madness. Prisoners who attempted to communicate with other inmates or who lost it were punished severely by guards who would dunk them in a bath of ice-cold water then hang them from a wall for the night (The Water Bath), or strap them into a chair until they passed out (The Mad Chair), or keep them locked in a pit in the ground for weeks (The Hole). The most feared of punishments was The Iron Gag; a device that was clamped onto the tongue and chained to the hands while hands were tightly clamped behind the inmate's back. Any movement would result in tearing of the tongue and some prisoners would die due to blood loss. Although torture was not officially endorsed by the Eastern State system, guards took it upon themselves to ensure that prisoners were punished. Charles Dickens, after a visit to the Eastern State in 1842, wrote that, solitary confinement and psychological torture was more agonizing than physical torture, and despite the good intentions of the ideologues of the penitence system, they did not know what they were doing. Good intentions do not always translate into good deeds. Without wisdom, they rarely do.